Fun, creative work environment with employees and customers who love what we do. We do all the sales, marketing & collections, you get to focus on teaching. Get paid for same day no-shows. 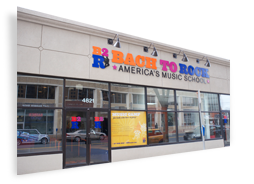 Our facility is an amazing place for creating and learning music. As employees you have access to use our professional 48 track recording studio/control room, private rooms and band rehearsal studios when not being used by the school. Convenient hours so you are free to gig and audition at night. Great career options as we expand our fast-growing collection of music schools throughout the NY tri-state area and beyond.